The Second World War saw many acts of bravery, but the raid on St. Nazaire in March 1942 remains one of the outstanding acts of heroism during the war. So much so that ‘Operation Chariot’ has been called ‘The Greatest Raid of All Time’, and immortalised in film and book. So, why was the raid necessary? And what happened? In 1942 Britain was dependent on supplies from across the Atlantic if she was to survive the war, but that lifeline was constantly under attack. Supply convoys were frequently attacked by German submarines and surface raiders, but the biggest threat to shipping was the Tirpitz. No British or American ship could compete with her 15-inch guns and massively armoured structure. The Royal Navy hoped that a fleet could possible sink her, or at least damage her so much that she would be in need of extensive repairs, so relieving some of the pressure on the convoys. If they managed to damage the ship there was only one port in Axis held Europe large enough to accommodate her – St. Nazaire on the Atlantic coast of France. A massive dry dock had been built there before the war to accommodate a passenger ship called the Normandie. The port was now being used by the Germans to bolster their war in the Atlantic. The British decided that this facility must not be available to the Tirpitz, and so an attack was planned to take it out. It would not be an easy task. Huge 35 foot thick gates, 167 feet wide and 54 feet high, moved on massive rollers to enclose a dock measuring 1,148 feet by 164 feet. This dock played host to small German warships and a fleet of U-boats which sortied out to seek and destroy the Allied supply convoys. To service and supply these was a collection of wharves, bridges and locks, a power station and underground storage for fuel. Minesweepers and searchlights constantly combed the area to prevent any Allied attack. In support of these were around 100 massive guns. To try to take out such an installation would seem impossible. Bombing the dry docks was not an option as chances of a successful raid were remote. 80 anti-aircraft guns surrounded the area, and bombing would need to be accurate to do the necessary damage, but such pinpoint targeting was not possible in 1942. Even blanket bombing the area would not work as there could be no guarantee of success, and such a raid was likely to result in many civilian casualties. An attack by the navy was also impossible as the ships would not be able to get close, thanks to the narrow and shallow estuary protected by submarine nets, which also ruled out an underwater attack. It was therefore decided that a force of commandos would attack the docks at St Nazaire during the last week of March 1942, which would give them a two hour window of full moon and a flood tide, vital for the attack to succeed. The plan was for some of the commandos to travel on motor launches with a shallow draught so that they could move in the waters of the estuary without entering the heavily fortified areas. The lead boat was to be a motor gunboat which could use radar and sonar to help the attack. The final boat was a motor torpedo boat which would lay torpedoes with delayed fuses. It was a good plan, but the dock was so huge that it was believed that the boats and commandos would not be able to put it out of action alone. That was when it was decided to take a leaf from the history books. England had caused devastation to the Spanish Armada through the use of fire-ships; perhaps something similar could work in St Nazaire? An old ship reaching the end of her life, HMS Campbeltown, was chosen for this role and underwent a facelift which left her looking a little like one of the German Mowe class warships. Unlike a warship, Campbeltown was lightly armoured and gunned, but she did have 24 depth charges which were the key to the plan. The ship was to smash her way through the massive gates to be scuttled in the dock with her explosives set on a timed fuse. When this triggered it would, it was hoped, put the dock out of commission for the rest of the war. Whilst Campbeltown was being scuttled, the commandos were to target the guns, bridges, lock gates and power stations which made St Nazaire such a dangerous asset for the Germans. The landing force of what was considered by most to be a suicide mission, was made up of 256 officers and men. Vice Admiral Louis Mountbatten, Chief of Combined Operations, told Lieutenant Colonel Newman (leader of the attacking force) that he and his men were, in effect, being sacrificed. He told him that ‘I’m confident that you can get in and do the job, but we cannot hold out much hope of you getting out again. Even if you are all lost, the results of the operation will have been worth it. For that reason I want to tell you to tell all the men who have family responsibilities, or who think they should stand down for any reason, that they are free to do so, and nobody will think any worse of them.’ Not one man took up the offer. The training for the mission was intense, as was security. It would be a disaster if news of the target got out, so rumours were spread about that the force was going to North Africa, or possibly submarine hunting in the mid-Atlantic. No one mentioned France. By the middle of March, everything was ready. The force set sail from Falmouth on 26th March, heading out into the Atlantic ocean. The next day, the ships hoisted the German flag and changed course for St Nazaire. At 11pm on 28th March the timer for the explosives on the Campbletown was set as the force made its way into the Loire estuary. Careful navigation of the sandbanks and shallows was essential, which slowed the flotilla down, and the force was spotted just before 1.30am. When the German guns opened up the false German colours were run down and the ships sailed into St Nazaire under the white ensign. As the Campbletown sped towards the dock gates she was raked with gunfire, but did not slow down, smashing into the gates at 1.34am, just 4 minutes behind schedule. Many commandos never made it to shore, but those who did encountered fierce opposition from the defenders. They fought heroically as they planted their charges, all the time aware of the German guns pouring heavy fire onto the British boats which should have been there to extricate them and take them home. Newman was aware that the boats had been forced to withdraw and that he and his men were, effectively, stranded. He managed to gather together around 70 men, most of them wounded, and gave them the news that they would have to make a break across country, to make for Spain if at all possible, a journey of 350 miles. But the enemy were everywhere and, one by one, the raiders were shot or taken prisoner. Other commandos, who had been on the flotilla as it withdrew, were taken swiftly north towards England, the ships fighting all the way. The enemy were now out in force, though, and not all of the ships made it home. Soon the fighting on both land and sea was over. In the dry dock 40 German officers went aboard the Campbeltown, gloating that the British had underestimated the size of St Nazaires defences. There were also another 400 Germans in the vicinity when the timer on the explosives in the Campbeltown’s bow reached zero and the ship exploded. The damage was so great that the dock was unusable for the rest of the war. The British had not underestimated the job after all. No-one knows for sure, but it is thought that the Germans lost 60 officers and 300 men when the Campbeltown exploded. Added to those killed or wounded in the fighting, this was a great blow to the Germans. The British lost 169 killed with about 200 taken prisoner, most of them wounded, only 4 men made it overland to Spain. Operation Chariot was a great success for the British. No one can calculate how many ships were saved, how much food and ammunition reached Britain which would, perhaps, have ended on the bottom of the Atlantic Ocean if the raid had failed, but it was a very significant contribution to the Allied cause. Although the raid was a great blow for the Germans, the defenders recognized the amazing courage of the commandos who had taken part in the attack and mounted an honour guard over the coffins of the dead. 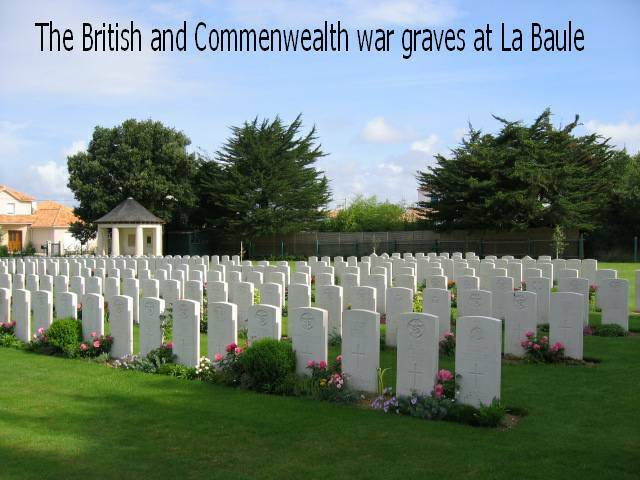 This courage was also recognized back at home – 51 men were mentioned in dispatches, 74 British decorations awarded, 4 French Croix de Guerres, and 5 Victoria Crosses. Captain Robert Edward Dudley Ryder, RN. For great gallantry in the attack on St. Nazaire. He commanded a force of small unprotected ships in an attack on a heavily defended port and led HMS Campbeltown in under intense fire from short range weapons at point blank range. Though the main object of the expedition had been accomplished in the beaching of Campbeltown, he remained on the spot conducting operations, evacuating men from Campbeltown and dealing with strong points and close range weapons while exposed to heavy fire for one hour and sixteen minutes, and did not withdraw till it was certain that his ship could be of no use in rescuing any of the Commando Troops who were still ashore. That his motor boat, now full of dead and wounded, should have survived and should have been able to withdraw through an intense barrage of close range fire was almost a miracle. Lieutenant-Commander Stephen Halden Beattie, RN, HMS Campbeltown. For great gallantry and determination in the attack on St. Nazaire in command of HMS Campbeltown. Under intense fire directed at the bridge from point blank range of about 100 yards, and in the face of the blinding glare of many searchlights, he steamed her into the lock gates and beached and scuttled her in the correct position. This Victoria Cross is awarded to Lieutenant-Commander Beattie in recognition not only of his own valour but also of that of the unnamed officers and men of a very gallant ship’s company, many of whom have not returned. Able Seaman William Alfred Savage, RN. For great gallantry, skill and devotion to duty as gun-layer of the pom-pom in a motor gun-boat in the St. Nazaire raid. Completely exposed, and under heavy fire he engaged positions ashore with cool and steady accuracy. On the way out of the harbour he kept up the same vigorous and accurate fire against the attacking ships, until he was killed at his gun. This Victoria Cross is awarded in recognition not only of the gallantry and devotion to duty of Able Seaman Savage, but also of the valour shown by many others, unnamed, in Motor Launches, Motor Gun Boats and Motor Torpedo Boats, who gallantly carried out their duty in entirely exposed positions against enemy fire at very close range. Sergeant Thomas Frank Durrant, RE Sergeant Durrant, attached to No.1 Commando, was in the Royal Engineers. On 27th March 1942 at St Nazaire he was in charge of a Lewis gun on HM Motor Launch 306 which came under heavy fire during the raid, and although he had no protection and was wounded in several places he continued to fire until the launch was boarded and the survivors were taken prisoner. He died of his wounds the next day. (It is believed that Durrant was wounded at least 25 times. He was captured and taken to a German military hospital where he died of his wounds. A week later, the commander of the German destroyer which had captured Durrant met Newman in a prisoner of war camp and suggested that the Colonel might wish to recommend Durrant for a high award. Durrant’s Victoria Cross is unique as it is the only award given to a soldier taking part in a naval action, and it was awarded on the recommendation of the enemy commander). Lieutenant Colonel Augustus Charles Newman The Essex Regiment was attached to No.2 Commando. During the St Nazaire raid on 27th March 1942, Lieutenant-Colonel Newman was in charge of the military forces and was one of the first ashore, leading his men and directing operations without regard for his own safety. The troops fought well under his command and held superior numbers of the enemy at bay until the demolition parties had done their jobs. Newman then attempted to fight through into open country and did not surrender until all the ammunition was exhausted when he was then taken prisoner. Other awards were granted for the St. Nazaire Raid: 4 DSO; 17 DSC; 11 MC; 4 CGM; 5 DCM; 24 DSM and 15 MM. Another 51 men were mentioned in dispatches, 22 of them posthumously.